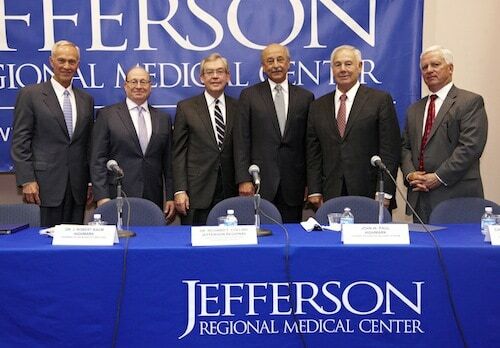 Jefferson Regional Medical Center today announced that its Board of Directors has unanimously voted to pursue a strategic partnership with Highmark. The announcement was made by John J. Dempster, President and CEO, Jefferson Regional Medical Center and Highmark’s Chairman of the Board J. Robert Baum, Ph.D.
From left: J. Robert Baum, Ph.D., Highmark Chairman of the Board; John Dempster, President and CEO, Jefferson Regional Medical Center; Richard Collins, Jr., M.D., Executive Vice President and Chief Medical Officer, Jefferson Regional Medical Center; John W. Paul, Highmark Leader Integrated Delivery System; Charles Modispacher, Chairperson, Jefferson Regional Board of Directors; and James Cooper, Senior Executive Vice President, Jefferson Regional Medical Center. This partnership is an important step in the development of Highmark’s integrated delivery system. The partnership is expected to create even higher quality healthcare, improve care coordination through innovative technologies, expand community-based services and generate a more satisfying care experience for patients. A new, state-of-the-art Emergency Department and expanded services at the Bethel Park Campus. Expanded clinical services, such as neurosurgery and gynecology. $75 million for improved community health and wellness care with Highmark support to Jefferson’s Foundation. Highmark has committed to supporting Jefferson’s medical staff in providing health and wellness care in the community, and promoting the Jefferson brand. The management of Jefferson Regional Medical Center and Highmark will continue discussions with the goal of finalizing the relationship, which must be approved by the Pennsylvania Attorney General and Allegheny County Orphan’s Court.